Reason #1 - Measure J will result in a net $67 million loss to the City's General Fund. Most Santa Clarans are not aware of this finding which appears in the city's economic study. What this means is that even after all direct and indirect stadium revenue to the General Fund is counted, the General Fund still ends up losing a net $67 million -- because the revenue is not nearly enough to offset the cost. Unfortunately, the 49ers marketing materials falsely claim that the General Fund will not be impacted. It will, by $67 million. You may have read that no General Fund money goes into building the stadium. This is literally true, but misleading, because redevelopment money which would otherwise flow into the General Fund will be diverted to pay for stadium construction. This diversion, plus other losses caused by the stadium total $98 million. The expected stadium General Fund revenues over the 40 year lease, including rent and all new taxes, total only $31 million. The result is a $67 million net loss. (i.e. 98-31=$67 million). The General Fund is used by the city to pay for police, fire, libraries and parks, etc. The loss of $67 million will have a major impact on these services. The current General Fund budget is approximately $150 million. $67 million is enough money to keep the city going for over 5 months. While the 49ers promise that there will be no taxes, less money in the General Fund will eventually result in either reduced services or new taxes. The City Council just hasn't addressed that yet. The $67 million figure is in "net present value" or today's dollars. In nominal dollars, the figure is much greater. We use "net present value" because it is used by city staff, and is consistent with standard accounting principals. 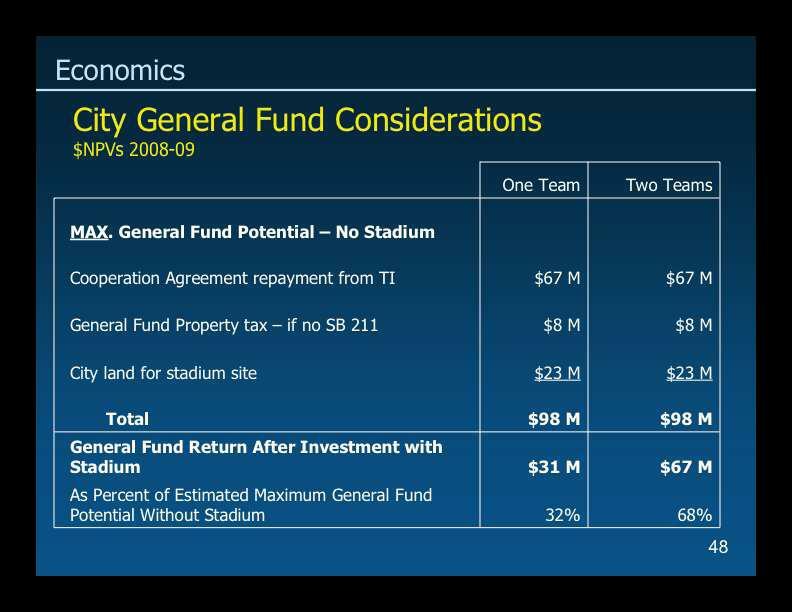 Source: Slide 48 in City's 6/2/09 Powerpoint presentation, "City General Fund Considerations"